Dr. Mogens Hansen (right), receives the fifth annual Henry Schein Cares International Veterinary Community Service Award. Dr. Mogens Hansen, champion of global animal health and rabies vaccination programs, has received the fifth annual Henry Schein Cares International Veterinary Community Service Award. 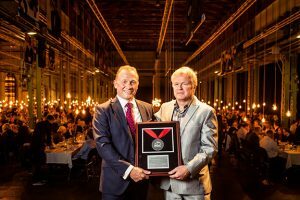 The Danish Small Animal Veterinary Association (DSAVA) nominated him in recognition for his long-standing involvement in animal welfare in developing countries. He received the award at the World Small Animal Veterinary Association World Congress 2017 in Copenhagen. Besides running his own small animal clinic in Denmark, since 2006 Dr. Hansen has participated in more than 15 animal birth control and rabies vaccination programs for stray dogs in India and Thailand. Vets Beyond Borders Denmark aims to neuter and vaccinate at least 70 percent of the street dog population in a particular area and ensure a local caregiver feeds the animals. Vets Beyond Borders Denmark has neutered and vaccinated more than 10,000 dogs and cats around the world. Hansen also supports a range of animal welfare projects in Central America, Africa, Eastern Europe, and Asia. He is a co-founder of and contributor to netdyredoktor.dk, a website he developed with Danish colleagues that has become an online destination for animal health in the Nordic region. Mike Ellis, president, European Animal Health Group, Henry Schein Inc., presented Hansen with the award. Hansen asked that the accompanying check for $5,000 be donated to Vets Beyond Borders Denmark.